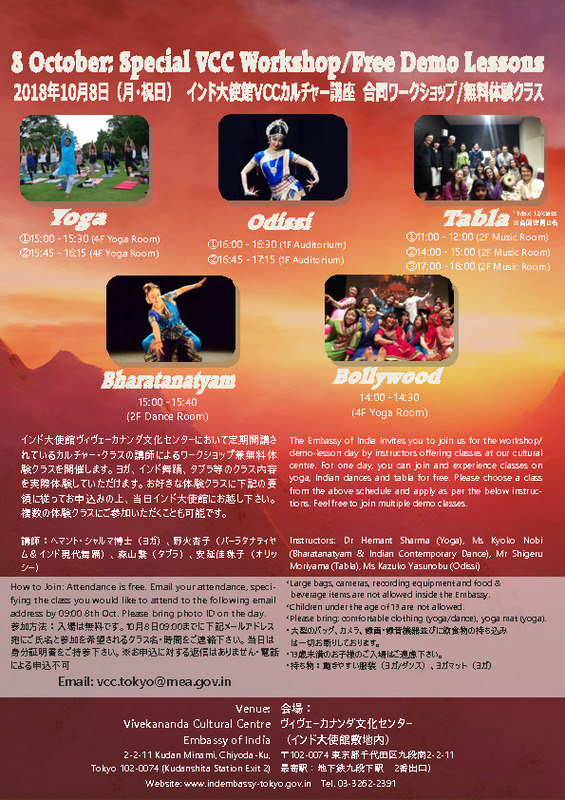 a free workshop and open lesson day on Yoga, Tabla, Odissi, Bharatanatyam and Indian Contemporary Dance conducted by instructors at the Vivekananda Cultural Centre　at the Indian Embassy of Tokyo. 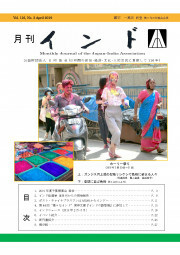 If are interested in the cultural courses at the Embassy, this is a great opportunity to see what is on offer. Feel free to try multiple demo lessons. All demo lessons will be conducted in the Vivekananda Cultural Centre, Embassy of India. Please see flyer image for details on the programme. 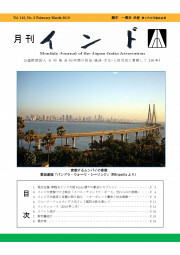 Date & Time: Monday 8th October (Japanese Holiday) / Times depend on each class. Please see flyer image for details. 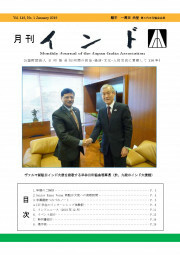 Address: Embassy of India, 2-2-11 Kudan Minami, Chiyoda-ku, Tokyo 102-0074. Please convey your participation, specifying which demo class you would like to attend to the following email address: vcc.tokyo@mea.gov.in Please email full names of all participants, specifying which demo class(es) you would like to take on the day, and registration is complete. Kindly note that no return emails are sent out.) Kindly note that reservations cannot be made by telephone. - Food, beverages and large bags are not permitted on the premises. - Content offered in demo classes may differ from regular classes.